We’d love your help. Let us know what’s wrong with this preview of Brief Encounters with Solitary Souls by E. Journey. Eugene O'Neill says it best: "Life is for each man a solitary cell whose walls are mirrors." Five people—as different from each other as you and those around you in an anonymous crowd— go through personal crises. Scattered in time and place, their lives never touch. But they are bound by this: All are solitary souls. Would they sense that kinship if they ever met? From Par Eugene O'Neill says it best: "Life is for each man a solitary cell whose walls are mirrors." From Paris to Honolulu, each character realizes how alone she (or he) is at moments that matter most. In those turning-point moments, she clearly sees herself. At a Paris Café. In early 70s Paris, a naive and eager young man chooses not to go with his buddies on a trip around the country on his summer vacation. He goes it alone in Paris. He falls in love for the first time and at first sight in his first encounter with a French couple at a café. But this encounter shakes his illusions about Paris, about love, about life. The Gypsy. A boy recently uprooted to Paris by his parents’ divorce learns some life lessons from an old gypsy he watches through a third-floor apartment window. He sees how different she is from him, but deep inside, he feels an uneasy kinship with her. The Sum of a Young Life. Finding a young woman’s journal at a Berkeley coffeehouse upsets an urbane but blasé young man’s precise routine. Unable to control his curiosity, he opens it and discovers a life that touches him. In a Few Fast Heartbeats. In the Napa Valley, a middle-aged wife and mother is taking her husband home after a heart surgery. She’s looking forward to family time and the old comforting routine. But her life changes in the blink of an eye. 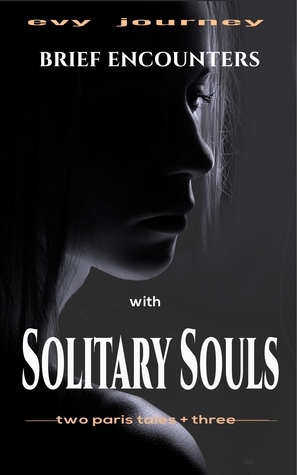 To ask other readers questions about Brief Encounters with Solitary Souls, please sign up. Brief Encounters With Soliatary souls is a collection of short stories . The writer takes the reader into the midst of the story by clever description and helps set the scene. The first 2 stories are based in Paris and I could picture sitting at a Bistro watching the world go by. I enjoyed the stories. The author made me feel as though I were in Paris in the first two. I have never been there but France has been a dream spot. When I was a girl I had a French pen pal. I loved her. She was awesome. The photos she shared of her home were incredible. It was when I fell in love with France, though not Paris. I have imagined Paris to be somewhat like the big cities here in the States. I don't love them either. But it was interesting to read of the author's Paris. If I make it I enjoyed the stories. The author made me feel as though I were in Paris in the first two. I have never been there but France has been a dream spot. When I was a girl I had a French pen pal. I loved her. She was awesome. The photos she shared of her home were incredible. It was when I fell in love with France, though not Paris. I have imagined Paris to be somewhat like the big cities here in the States. I don't love them either. But it was interesting to read of the author's Paris. If I make it to France, I may have to take a day or two for Paris. The third story, Dylan's, was amazing for me. I wondered if I would have read the found journal. Maybe not before but after reading this story, possibly. The journal was like looking in a mirror. The entries were filled with my questions and feelings. With Emmy I recalled my dad's heart surgery and recovery. With Dinah I had a deep sadness that turned chilling. It is a short story and I need to know Dinah made it okay. It speaks volumes of the author's writing skills that they can make care so much with so little. Then came Augusto and I knew the three were destined for horror. What followed was harrowing. Then we come to the final story set in Hawaii. Another dream place I have never been. As I read each story I thought about how I enjoyed it. Each one becoming my favorite until the last. Usually I go back and pick which one is really my favorite, after letting the taste of each settle. But this time, I know it will not change. This is my favorite. The one I want to return to. This book of short stories touched me deeply. The stories, the people have stayed with me. I actually finished the book the day after I got it. I just wanted to savor the stories. I wanted to see how the held up in the days after since each left me with strong feelings. The feelings haven't changed. I see the titles and am able to recall not just the tale but those feelings. This book is on Kindle, an electronic book. I see books all the time that are hard copies not available on Kindle and there is a link to click to say, "I want this on Kindle." For this book I want a link to say, " I want this in paper copy. It has touched me so that I want it on my shelf where I can see it, touch it, smell the pages and visit with it like a well loved friend." Unfortunately, there is no link for that. If you are thinking of getting this book, I encourage you. I hope it will touch you as much as it does me. It is a beautiful book. This book consist on five stories, all of them are worth a read. The writing style is superb and the voice is warm and cozy. The first two stories are set in Paris, I never been to Paris it made me feel I was inside the stories. My favorite was "sum of a young life" it's about a man who finds a journal really enjoyed that heartwarming and touching. Thank you to author and book tasters for giving me the opportunity to read this book. I wasn’t sure what to expect when I chose this book. I enjoy short story books, since they give readers great insight into an author’s writing. Readers can then easily decide, in a short amount of time, whether they're interested in reading more from the author. I wasn’t disappointed in this book. The author’s writing is intelligent and draws the reader in immediately. I loved reading about the various characters in the story. My favorites were “The Gypsy” and “Fragrant Green Mangoes” – they both managed to tug at my heartstrings, which tells me the author knows how to write emotionally-charged stories that include likable, realistic characters. Ms. Journey also includes several generous excerpts from her other books. Judging by Brief Encounters with Solitary Souls and the additional book excerpts, I’d be more than willing to read more from this author!